Everyone has a candy preference, some go for hard candy, while it’s bonbons for others. But if you’re a jelly bean or gummy bear person — these chewy strawberry chocolate gummies are for you. If you dare to look at the ingredients list of most candy, you’ll find them loaded with non-food ingredients like artificial flavors and preservatives. In these gummies, you get the natural strawberry flavor from the fruit and dark chocolate from the Chocolate Keto Base powder. Strawberries are a wonderful source of antioxidants and other nutrients, and the Keto Base can provide a boost of energy. These treats are perfect for after a meal or before a tough workout. When you’re trying to lose a few pounds, hunger can become a massive barrier to success. Cravings are an even bigger problem if you’re cutting calories or trying a low-fat diet. On the one hand, appetite is a good sign that your metabolism is working well. On the other, excess cravings can throw you off track when it comes to weight loss. Exogenous ketones may help control your appetite. Research shows that when people take exogenous ketones (specifically beta-hydroxybutyrate), they experience lower levels of the hormone ghrelin, known as the “hunger hormone,” and subsequently have lower appetites and desire to eat[*]. Who doesn’t want a full head of thick, healthy hair? When researchers gave a group of people gelatin supplementation and then measured their hair thickness, 70% of participants showed between 5-45% increase in hair diameter. After six months of no longer taking the gelatin supplement, their hair had returned to normal. This suggests that it was, in fact, the gelatin that increased the thickness of the participant’s hair[*]. These gelatin-based gummies are a great start. Snack on a few every day, in addition to putting some collagen powder in your coffee, and you’ll be on your way to thick, gorgeous hair. The exogenous ketone, beta-hydroxybutyrate (BHB), may have the ability to improve your brain function. Glucose is the brain’s primary energy source, but when glucose is low, you can begin to notice brain fog and impaired concentration[*]. When you’re in ketosis, you don’t have to worry about low glucose because your body is no longer relying solely on glucose for fuel, you have ketones to supply your energy. In one study, researchers gave a group of patients with Alzheimer’s disease MCTs (medium chain triglycerides), which convert into BHB in your blood and then measured cognitive performance. The Alzheimer’s patients saw improved cognition, and the improvement continued in a dose-dependent manner. That means, the more ketones in the blood, the better their cognitive performance[*]. If you do a quick search of keto-friendly treats, you’re going to come up with tons of fat bomb recipes, keto-friendly cookies, brownies — you name it. But if you’re really missing gummy bears and sour patch kids, you’re in the right place. Maybe you like sprinkling chunks of gummy pieces on your keto ice cream, or perhaps you’re looking for an easy-to-digest pre-workout snack. 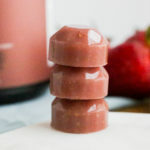 Either way, these chocolate strawberry gummies are completely sugar-free, keto, and ready whenever you need a sweet snack. Feel free to eat as is, or melt some sugar-free white chocolate or milk chocolate and lightly pour it over your choco strawberry gummies after they’re done setting. Craving gummy bears or jelly beans? These chocolate strawberry gummies have a natural strawberry flavor, are loaded with vitamins, and have no artificial flavors. Add the strawberries and almond milk to a high-speed blender, blending on high until well-combined. In a small pot over medium-low heat, add the strawberry mixture and, while whisking, slowly add in the Keto Base and grass-fed gelatin. Whisk until everything has dissolved and remove from heat. Fill the molds and allow to refrigerate for 15 minutes or until firm.